"This is a cool, creamy summertime dessert. It uses rennet custard mix - not available in all parts of the world." In a medium bowl, mix together flour and confectioners' sugar. Stir in melted butter. Press mixture evenly into a 12 inch pizza pan. In a small mixing bowl, beat together cream cheese and white sugar until smooth. Spread over cooled crust. Arrange strawberries over cream cheese layer. Combine custard mix and water in a small saucepan. Bring to a boil while stirring frequently. Boil and stir 1 minute. 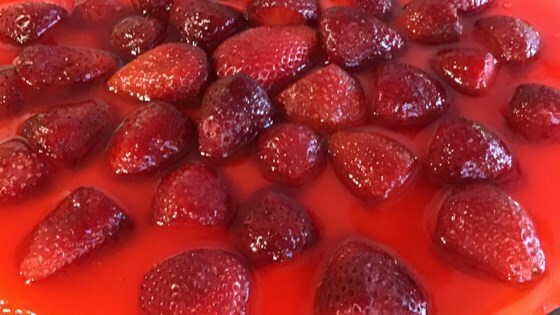 Pour mixture over strawberry layer. Chill before serving. Made it for 4th of July and everyone liked it. I couldn't find the danish mix, instead I used the strawberry glazed. Was disappointed in this. The crust was too wet and runny. Unable to pat it down because of this. I believe it needs more flour. This is VERY GOOD!!!!!! I didn't have a pizza dish, so I doubled the recipe and made it in a deep cookie sheet. My husband LOVED it and he's picky about desserts!!!! Thanks, Douglas!!! !